As the Holidays enter their final hours, Nintendo is making some bold statements on its Twitter account. A post on the company’s Twitter begins stating that “there are more great games on Nintendo platforms than anywhere else,” which isn’t an uncommon marketing statement to make, but it takes it a step further by laying out some statistics for fans to ponder on. 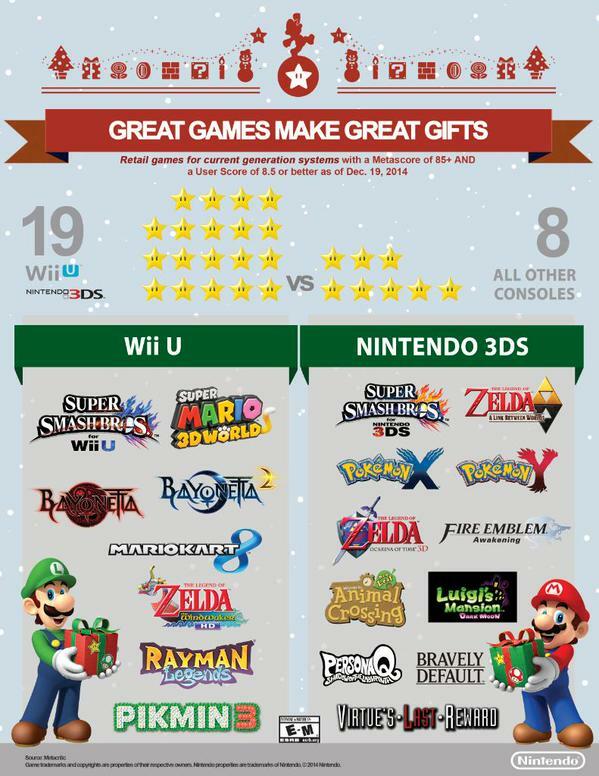 An infographic attached to the Tweet points out that, on current-generation hardware, 19 retail games from Wii U and 3DS’ catalog have an 8.5 or higher in both critical scores and user scores, while “all other consoles” only have eight. Just what consoles and eight games Nintendo is referring to is unclear, but it does explicitly state which 19 games it is citing on its own end, such as both the console and handheld versions of Super Smash Bros., Mario Kart 8, and even third party games like Persona Q: Shadow of the Labyrinth and Bravely Default. All things considered, Nintendo has had a pretty strong showing of games this past year, and in the face of some poor launches this holiday season, Nintendo is in a place where it can gloat a bit. Although, it’s not like the company has an upperhand in everything compared to its competition. Check out what we think Nintendo needs to learn from its competition.